Surprise: Food Network star Molly Yeh’s favorite dessert is cake. In fact, if she had one free day to do anything in the world she wanted, she’d bust out her fancy sprinkles and cake stand. So, naturally, when she recently stopped by the PureWow test kitchen to chat about her partnership with milk, we asked her to spill her favorite cake-decorating tip—which, ladies and gents, did not disappoint. Molly Yeh fans, take a moment to picture her cakes. They’re mirror-smooth. That’s her hallmark. Doesn’t everything make sense now? Another benefit of frosting a frozen cake? You don’t even have to do a crumb coat first because the crumbs really stick onto the cake. For the uninitiated, a crumb coat is a preliminary layer of frosting you smear on before briefly chilling the cake and frosting it a second time. Crumb coats trap, well, the crumbs, so they don’t mix with the rest of your frosting. After you’ve frosted your cake, stash it in the fridge to let it slowly thaw. Then bring it to room temperature, the ideal temperature for serving. Can't decide what kind of cake to bake? 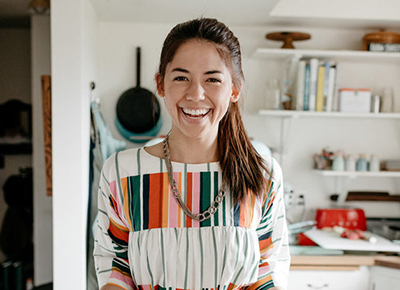 Don’t worry, Molly Yeh has you covered.